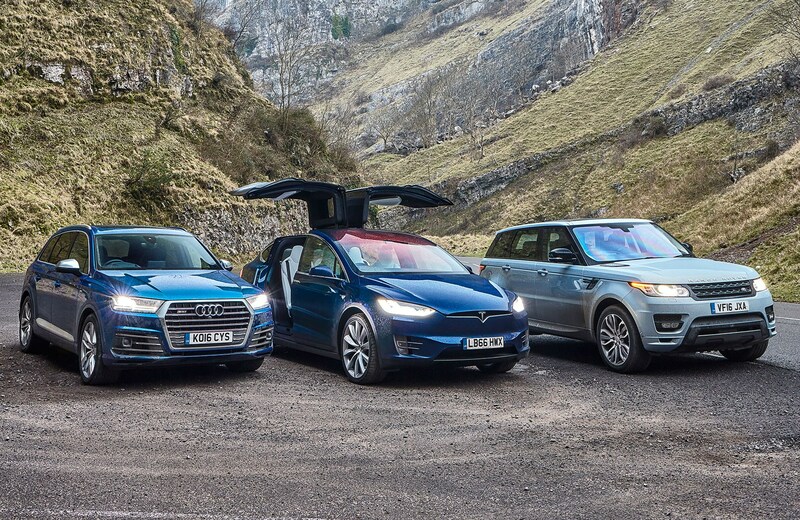 Tesla Model X vs Audi Q7 vs Range Rover Sport triple test review (2018): which is best on finance? Tesla Model X digital screen: huge! ► How much do you want the Range Rover? The electric SUV is now here, but don’t think it necessarily carries a premium over the diesel opposition. 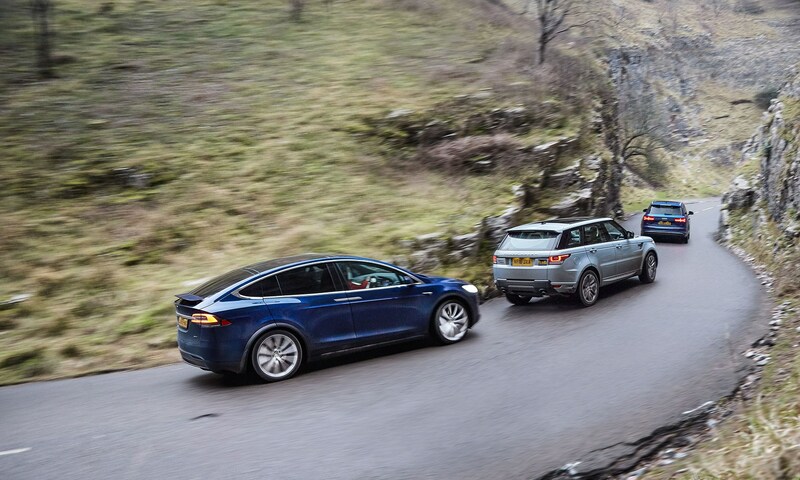 Choose the elephantine Tesla Model X 100D and you’ll actually save £173 per month on PCP finance compared with the V8 diesel Range Rover Sport. And you can plug in at home rather than wasting time on the forecourt trying to find the impossible-to-put-on plastic gloves at the black pump. Strange that a car as unorthodox as the Tesla Model X blends so completely into an urban streetscape. I’m en-route to collect it from a CAR staffer’s home, not checking house numbers because I’ll just stop when I see the all-electric SUV with double-hinged falcon doors and 22-inch rims making everything else appear archaic. But I drive straight past. Maybe it’s the sensible dark blue paint, or the slightly generic styling; maybe that those doors aren’t actually open, but my brain scans right over it. Odd, because the Model X is a future-leap. Its alien-ness does hit home when you make first contact, though: you don’t unlock the frameless front doors, don’t even press a start button, you just select Drive and whizz silently off into a parallel automotive universe. It’s simultaneously brilliant and have-I-forgotten-something odd, like glancing down at the office to check for trousers. Inside, there’s a huge 17-inch touchscreen angled directly at you to eliminate nearly all buttons, a cabin air filter to guard against that imminent bioweapon attack and a receding windscreen stretching back over your head like a spaceman’s helmet. 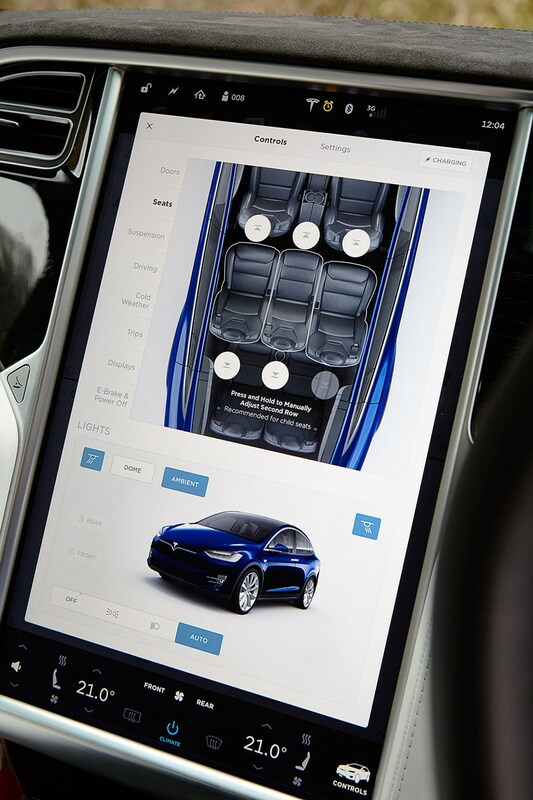 Disappointing that the Model X’s drivetrain is controlled via a column shifter – you expect switchgear shared with the Starship Enterprise, not Mercedes – because even today it remains a pretty radical proposition: you choose from three ‘D’ specs based on battery output: 75kWh, 90kWh and 100kWh, all with two e-motors that split torque between the front and rear wheels. They’re juiced by a lithium-ion battery slung low between those two driven axles on a platform shared with the Model S saloon. We’re testing the 90D, which claims 303 miles of range on the NEDC cycle and retails at £89k with the government plug-in car grant. It’s astonishingly rapid: flatten the throttle from standstill and you feel like a penalty-kick football booted by Rooney. I’m heading to Cheddar Gorge to meet the opposition, fast-forwarding past other traffic in my seven-seat future pod, able to call up autonomous functions to swap lanes hands-free, and I wonder if the Range Rover Sport and Audi SQ7 might feel like steam traction engines in comparison. Five years since Tesla released the Model S, mainstream rivals are still playing catch-up. The electric Jaguar iPace is coming, but the new Model X launches without direct rival. 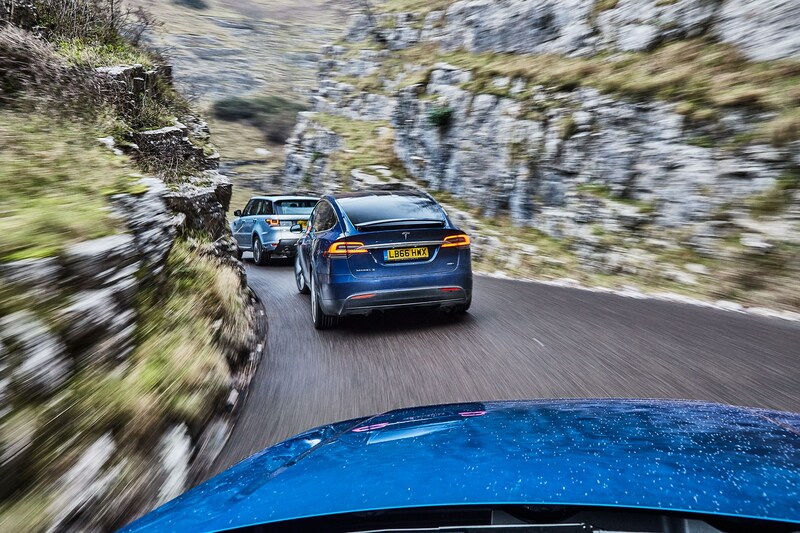 So if Tesla is going to talk you out of spending circa £90k on another seven-seat SUV, it’ll probably be a diesel; when did you see a Range Rover Sport hybrid or Audi Q7 e-tron? 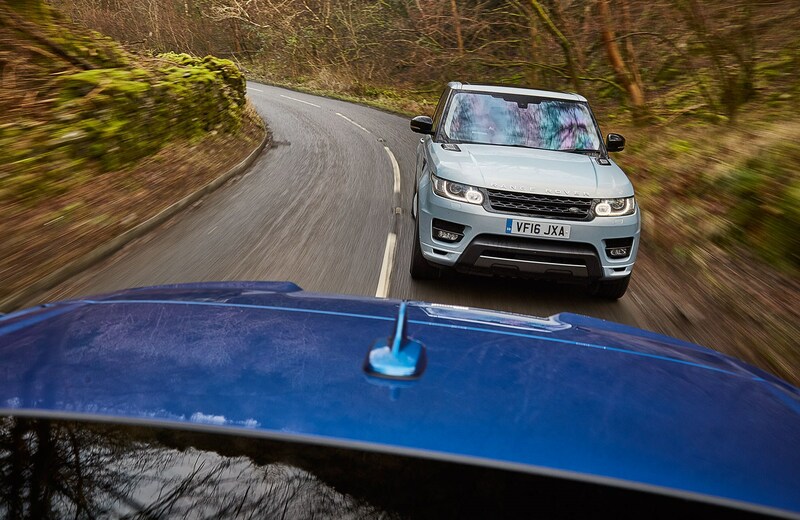 The Range Rover Sport arguably remains the ‘It’ SUV in this segment. Now four years old, it remains stately and special, if still representing fossil-burning, turf-churning rapaciousness to some. We’re driving the most powerful diesel, the 4.4-litre SDV8, with 334bhp and 546lb ft.
At a base of £84k, some will question your wisdom: both the 5.0-litre V8 and SDV6 hybrid have price parity, yet on-paper gains over the £6.5k-cheaper SDV6 are modest at 32bhp and 30lb ft, especially when the extra cylinders add weight and a steep 7mpg and 34g/km CO2 penalty. In the world of cost-cutting, buying a luxury off-roader is akin to tiling your kitchen with gold bars. But, that doesn’t mean you should be willing to write a blank cheque to your local dealer. Opt for the SQ7 on Audi’s PCP finance scheme and you’ll need to stump up a not insubstantial £748 per month (for a three-year contract with a £10,000 deposit and 10,000-mile-per-year allowance). 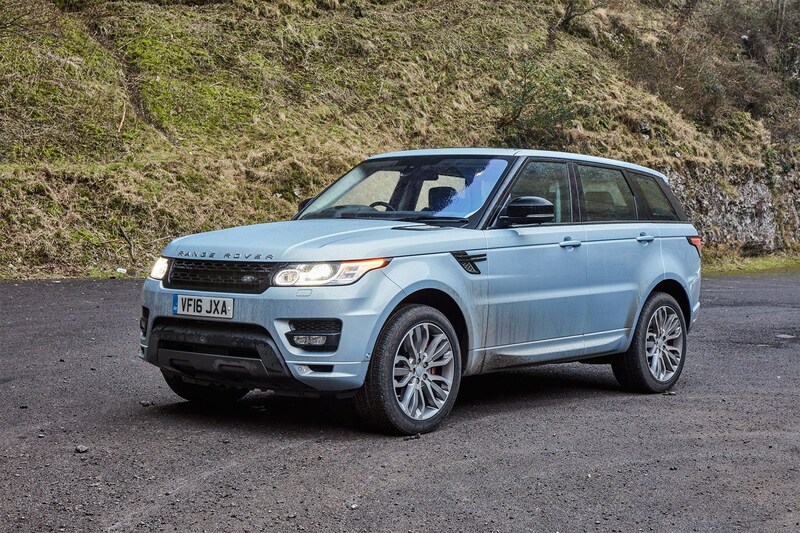 Go for the Range Rover Sport TDV8, however, and that’ll drain a staggering £1,177 every single month on an equivalent contract – that’s enough to cover £300,000’s worth of mortgage payments. The Tesla Model X, meanwhile – now in newer, more potent 100D form – weighs in at £1,004 per month (with matching contract terms). Not bad for a new-tech all-electric leviathan, compared with the diesel-chugging Sport. For more info on PCP finance and to find out how to get the most for your money, check out our sister site Parkers finance. Even in the world of luxo-SUVs the V8 diesel Range Rover Sport is seriously pricey. Enough so for anyone without blue blood to think twice. With more than a £400 – per month – premium over the Audi, potential Range Rover drivers willing to go German could save themselves enough to finance a Fiat 124 Spider and a VW Up GTI simply with the change. Don’t think we’re massaging the figures, either. For a total £10,000 deposit and three-year contracts the Audi, Fiat and VW combo would cost you £1,260 per month and allow you to cover 21,000 miles per year between them. A single Range Rover Sport, however, with a matching 21,000 mile contract wades in at £1,372 per month – meaning a near-£4,000 premium over the three-car garage over three years. The Range Sport’s stats are further shaded by the opposition. The SQ7 gets 95bhp/118lb ft extra, while the Tesla obliterates its 0-62mph time. In-car technology also lags. 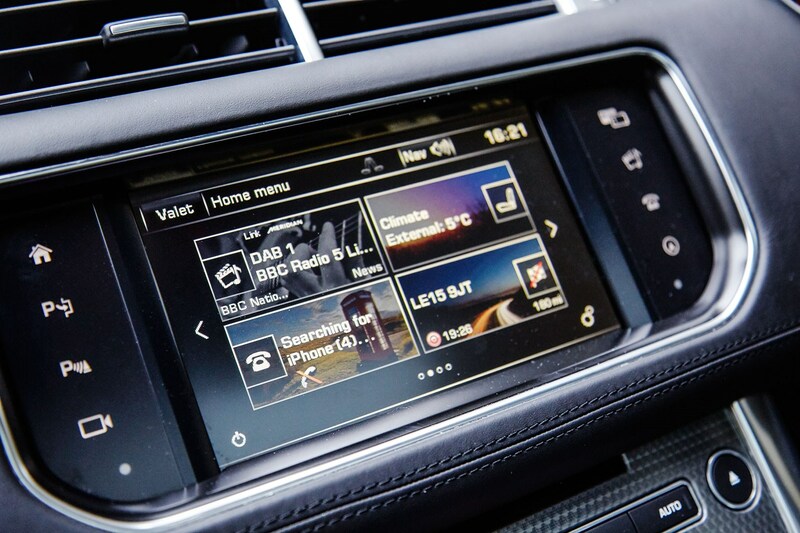 This test car gets the older infotainment system, with 17MY examples upgrading to much-improved InControl Touch Pro. 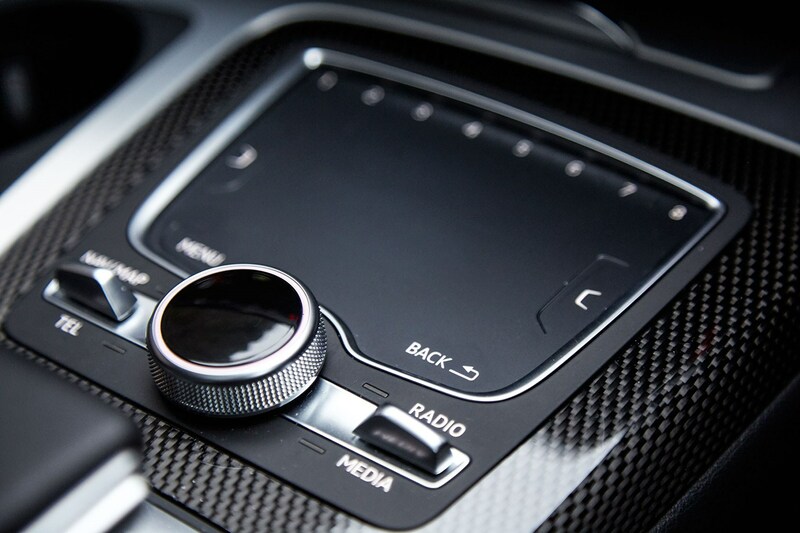 Even with this factored in, both rivals have more advanced infotainment. Our SDV8 is, however, well equipped in Autobiography Dynamic trim – the top spec on lesser models, the only spec for the SDV8 – with 21-inch rims, 18-way electric seats with perforated Oxford leather and a panoramic roof. A further £7k goes on options, much of which is infotainment or driver assistance. 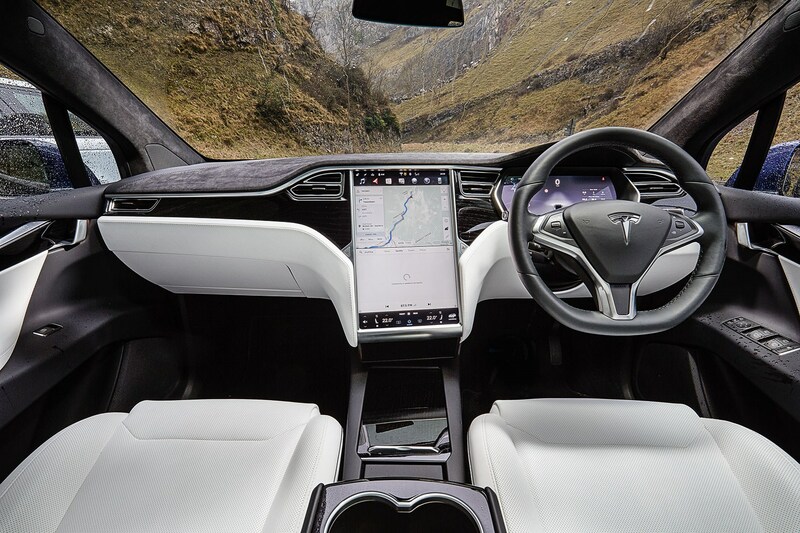 The instrument panel and centre console are organised in confident, classy strokes that make the others look fussy, and quality is higher than the Tesla, if behind the Audi’s execution. It’s a comfortable, reassuring place to be, with a sumptuous elasticity to the leather seats and steering wheel to ease you in. Nonetheless, it makes Audi’s SQ7 appear good value at £72k. Based on the same architecture that underpins the Bentley Bentayga, the SQ7 sits at the top of the Q7 range, the first flagship Audi SUV with an overtly sporty flavour. There’s something apologetic about the design, but the SQ7’s powertrain is more full-blooded. Powered by a 4.0-litre twin-turbo V8 diesel, it makes 429bhp and 664lb ft, and scoots to 62mph in 4.8 seconds. It’s an amazing engine, easily besting the Range Sport’s. A 48-volt electrical system allows for an electric-powered compressor to support the sequential twin turbochargers, responding in under 250ms and filling the gap before the turbos spool. It means response is instant, all 664lb ft floods in from 1000rpm, and there’s a linear lunge of thrust right round the dial, with no obvious step as the two technologies hand over. Later, when James Taylor guns the freakishly fast Model X out of a 30mph zone, the SQ7 will stay with it. It’s not just the Audi’s speed, it’s the character. There’s a deep, rocking lilt to the idle even as standard, but press Dynamic and the exhaust valves open and a muscular wob-wob-wob idle resonates in the Gorge’s echo chamber; it sounds so rude you’d almost forgive someone for filling it with 98 octane. A well-nourished options list increases the price of our test SQ7 by the equivalent of almost a whole Toyota GT86 to £95k. 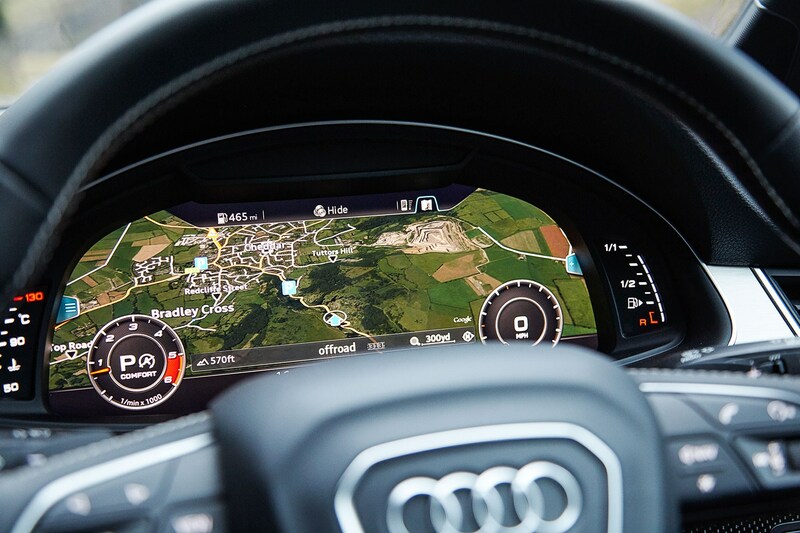 But there’s good kit as standard in the SQ7, including Audi’s brilliant Virtual Cockpit system, which replaces analogue dials with a driver-configurable display in the instrument binnacle; you can fill it with a sat-nav map and a small speedo and rev counter either side. There’s no touchscreen, just a rotary controller and a pair of switches to scroll between functions. I find it easier to navigate on the move with the rotary controller than poking about at a screen. You can also scrawl postcodes with your finger on the MMI touchpad, like a modern twist on Etch A Sketch. The Audi also comes as standard with third-row seating, unlike the Range Sport (where they’re optional) and the Q7 e-tron (which can’t fit a third row due to hybrid bits). The back row is tight, but the potential for all members of S Club 7 to tour in an SQ7 is definitely there. Anyway, I’m getting ahead of myself. I’ve just struck out in the Tesla, and there’s only 114 miles of predicted juice on the digital instrument display. Cheddar Gorge, our shoot location, is 64 miles away. Handily, the touchscreen comes to the rescue with a list of Supercharger stations in order of proximity, plus sat-nav directions. Perfect. 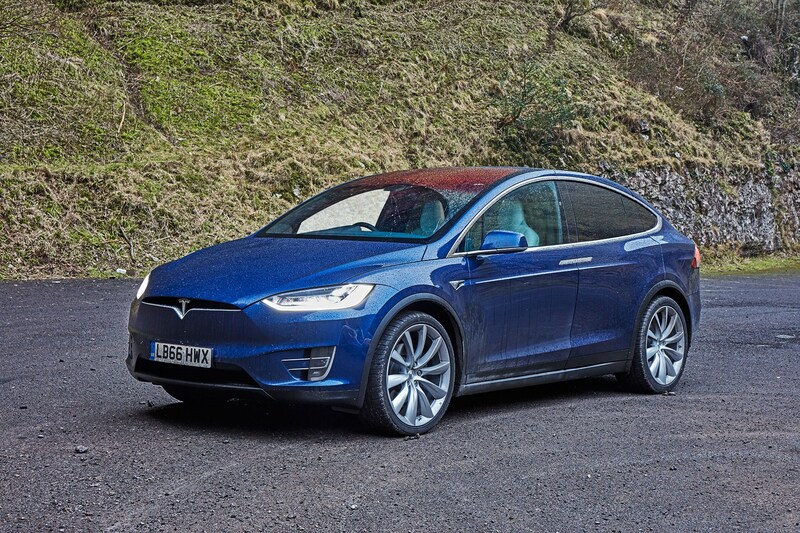 Tesla claims the lowest drag co-efficient of any SUV ever at 0.24Cd, but even at low speeds there’s so much wind noise you wonder if the falcon doors aren’t just not properly closed, but flapping about madly like said bird of prey trying to lift an Alsatian. The rubber seals at the top of the doors stand proud of the roofline, which may explain some of the bluster. There’s a lot of road noise from the 22-inch Goodyears too. Of course, the absence of combustion-engine racket does exacerbate such things, but I wasn’t expecting this rowdiness. The ride’s also too lumpy, and I struggle to get along with the regenerative braking, with even small lifts off the accelerator feeling like you’ve run out of bungee cord. I’ll deplete more range, but it feels so much more natural to drive in the low re-gen setting. After a 70-80mph cruise on the M5 with occasional 50mph roadworks, I arrive at Cribbs Causeway, 33 miles since we started with 114 range, now 60 miles to empty, and find the charging points. An owner would make it their business to know where suitable charging points were located, and how long to allow for recharging (the car tells you, if you’ve a destination programmed into the nav) – if, that is, they ever needed to charge their Tesla anywhere other than home or work. But in today’s context it feels like hassle. 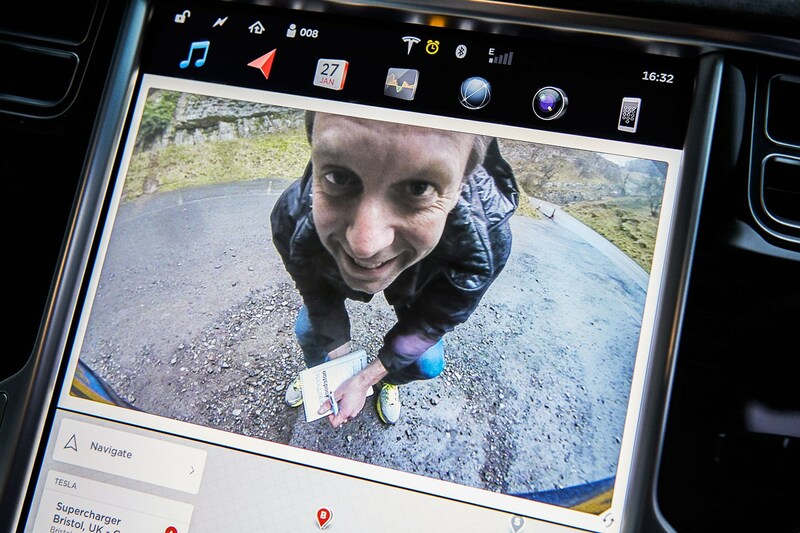 I plug in, and take the opportunity to have a good poke around the Tesla. There’s much to like. 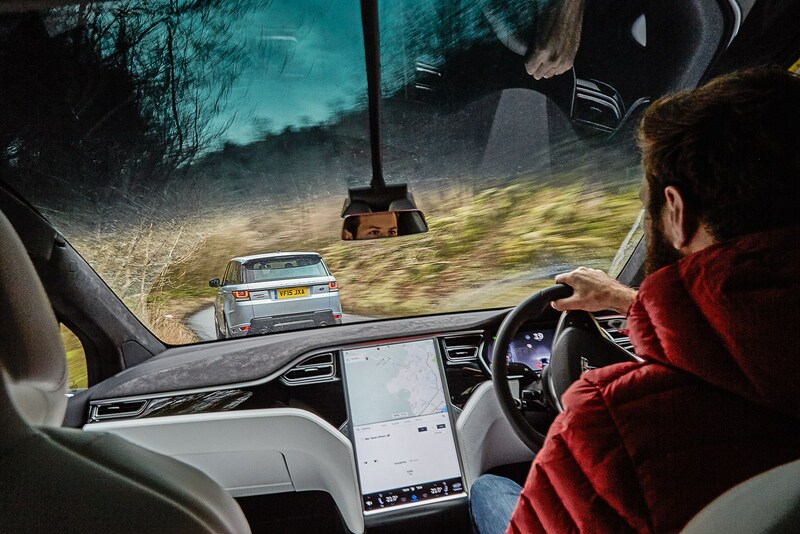 Where the early Model S had an almost flat, van-like floor – emphasising the lack of transmission tunnel, but leaving little oddment space – the Model X is more conventional, with a large centre console and ample stowage. Eight cupholders? There’d be so much Starbucks spillage in a rollover, you’d drown before the emergency services arrived. The seven individual seats are positioned in a striking two-three-two formation, like a football team after a few red cards; they look cool, and they’re quite comfortable and supportive – though the headrests feel wooden – and can motor forwards and back on slender-looking supports. It creates loads of space under the seats for feet and stowage, adding to the generous space in the boot and engineless ‘frunk’. Shame the second row doesn’t fold flat to maximise luggage space like the rivals. But there is opulent space in the second row – which you can move fore and aft via that touchscreen – and even grown-ups won’t complain if consigned to the back seats. There’s certainly more space here than in the Audi’s third row. After an hour the Tesla has 10 minutes of potential charge time left, but already an impressive 237 miles of range. I’m running late, so I decide that’s enough to cover the 60-mile round trip to Cheddar Gorge, with some test driving between. Arriving to meet the others I jump straight into the SQ7. After the Tesla, you notice the vast reduction in wind and tyre noise, as well as the smooth compliancy of the Audi’s ride. Crucially, though, our car also gets the Driving Dynamics pack, a mighty £5.7k option that adds an electronically controlled rear diff and taps into those 48-volt electrics to bring electro-mechanical active roll stabilisation: instead of anti-roll bars, two tubes are controlled by electric motors to resist body roll, and can be de-coupled altogether to improve ride comfort. It helps this 2.3-tonne SUV swoop through corners with deft composure, feeling agile and relatively light as it leeches itself to wet, tricky corners. It also feels decidedly rear-biased and bloody quick, yet safe and dependable in foul conditions. 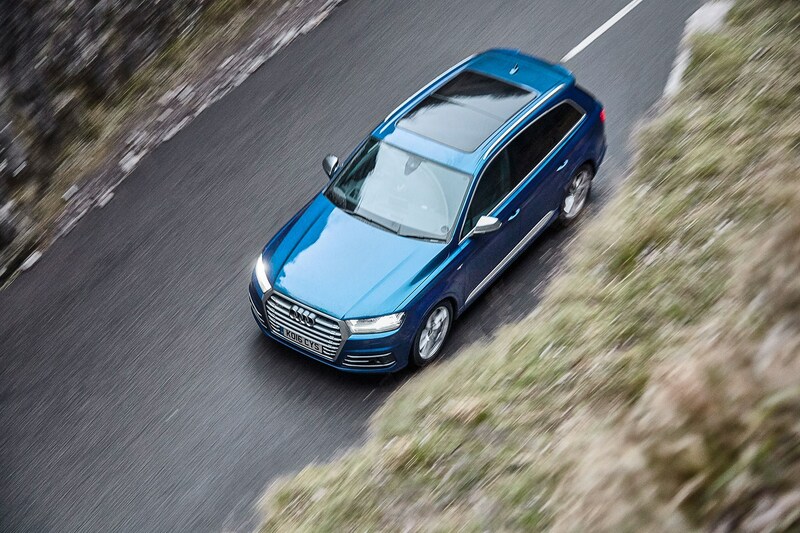 It’s a highly compelling drive, the SQ7. The Range Sport rolls more than the Audi, doesn’t offer much aural pleasure, and is noticeably slower in both speed and response. And yet I find myself warming immediately to it, something that starts with the excellent, comfy-pair-of-shoes driving position. The Sport is still effortlessly quick, there’s a more playful agility to the chassis balance than the Audi’s and in some cases I actually find the lower performance leads to a more fluid feeling through corners and a nicer balance between powertrain and chassis, where the Tesla and Audi both seem to chuck the horizon out of the rear window and leave you clinging on rather breathlessly. The steering is also much more naturally weighted than the Audi’s – light enough to shrug off the weight of that huge body, progressive enough to convey building cornering forces. And, of course, it’s the only car here to wear all-terrain tyres, backing up off-road cred like a low-range transmission and 850mm wading depth. Very nice. What does a Tesla feel like on a road that coils between sheer rock faces, where people in supercars come to drive for fun? Impressive, actually. Body control is good, traction is supernaturally strong, and the acceleration uncanny. The steering needs more off-centre definition, and the traction control can be too aggressive when you accelerate hard from a junction. But there’s something excitingly naughty about punting such a green car hard, even if there’s only so much of that performance you can actually use on a road this tortuous. We swap cars for the journey home, James Taylor taking the Tesla, me shadowing him to the Cribbs Causeway charge points. There’s 43 miles’ range left, down from 237 miles after 92 miles of sometimes spirited driving. The car’s considerable abilities encourage you to explore the performance, but it’s unwise if you’re a long way from a handy charging point. The Tesla has extraordinary performance, comes packed with technology and innovation, it’s highly practical and doesn’t burn fossil fuels (though, yes, where the electricity comes from is an issue); I want Tesla to succeed. The Model X has a lot going for it, but the price is high and the quality and refinement aren’t there yet. It feels like driving a motor-show concept car off the stand, and we’d criticise any production car for that; it’s what really counts against the Model X in this test. 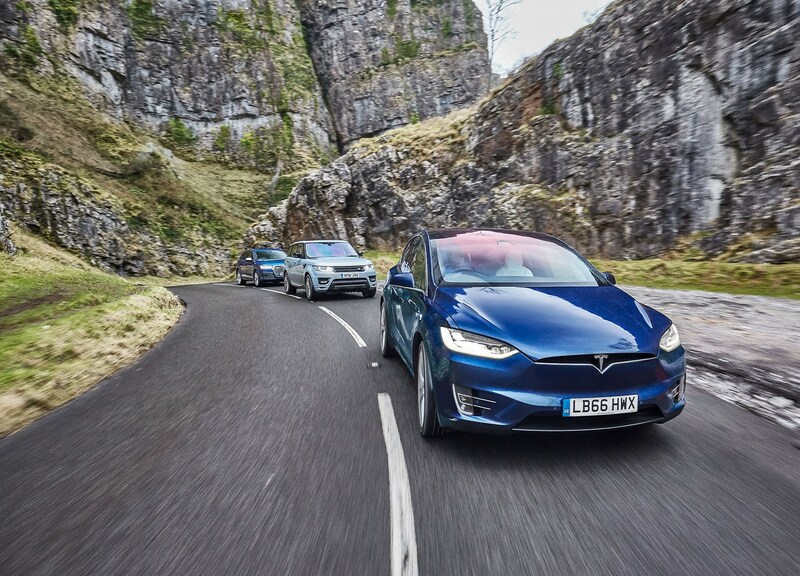 An owner doing even quite a long commute – especially those with a home charger, maybe one at work – should be fine, though relying solely on a Tesla in a single-car home would be brave. Our under-developed charging infrastructure will be more of a problem for some people than others. But as Tesla owners are often evangelical, it’ll be a hurdle they’ll want to overcome. 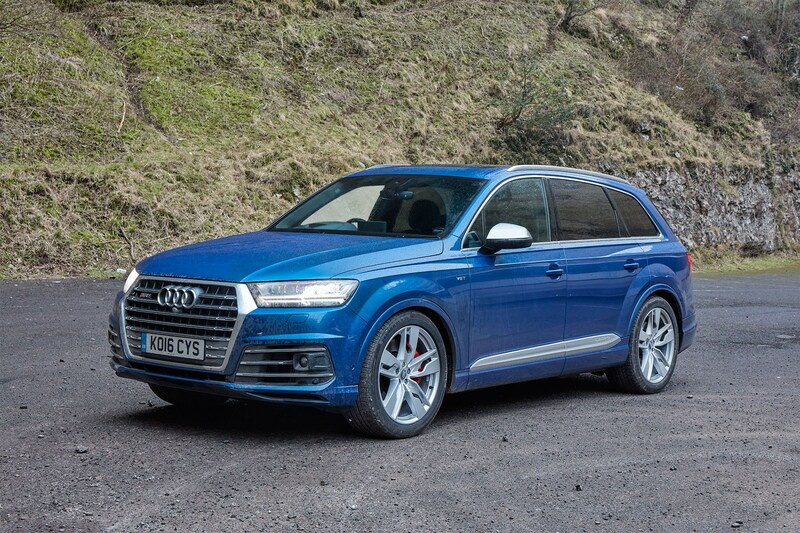 Choosing between Audi SQ7 and Range Sport SDV8 is not an easy call. 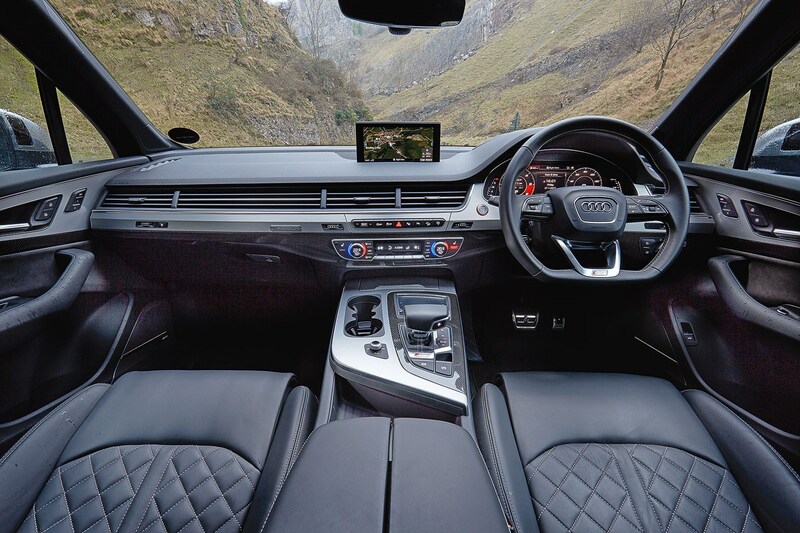 The Audi’s fresher and newer, it’s got the better powertrain by a sizeable margin, it’s much more powerful, it has a fantastic chassis, a greater sense of precision to its cabin, and it’s stuffed full of technology. The wins it scores over the Range Rover are big wins, where the Range Sport’s victories are squeaked by narrower margins. 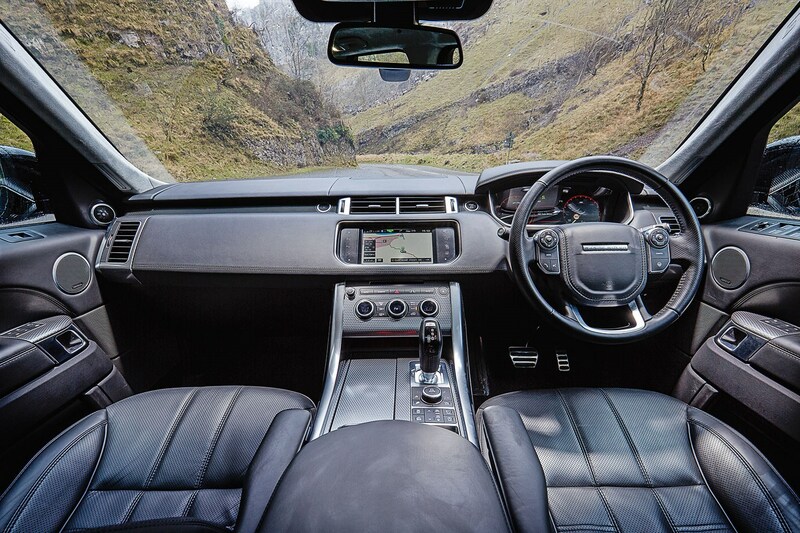 The Range Sport is older, more dated, the infotainment is less slick, the performance a notch down. And yet it’s generously and luxuriously equipped, its design both inside and out tugs at your heartstrings in a way the comparatively sterile Audi can’t, the ride is even plusher, the chassis and steering more feelsome, the driving experience more agile, and it confounded expectations by delivering better real-world mpg. Logically, I have to recommend you buy the SQ7, but the Range Sport doesn’t trail it home in second place by the margin the figures suggest. Desirability is hard to quantify, but it’s what keeps the Range Sport right in the fight to the finish line. Is that desirability enough to warrant an enormous £429 per month premium? Only you can answer that, but it’s a steep price to pay for a similar car. The Model X’s bold innovation still appeals, and it’ll be fascinating to see if JLR can match it head-on with the Jaguar iPace next year. The iPace, however, appears to suffer the same failing as the Range Rover Sport – at least at launch, with enormous finance costs. Find out just how much of a premium you’d have to pay for one over the Tesla Model X and Model S at our sister site Parkers Finance.